The Bodyguard debuted on May 2, 1948. Taking a page from the Captain Easy playbook, our hero Ben Friday was an adventurer in the employ of a rich eccentric. Officially Ben is a bodyguard as opposed to Easy's job description of troubleshooter, but the upshot is the same - derring-do and adventure all over the globe. The strip was written by Lawrence Lariar, better known as a gag cartoonist and editor of the long-running Best Cartoons Of series of books, with excellent art provided by John Spranger. Apparently the Herald-Tribune Syndicate wasn't having much luck marketing ol' Ben, so they decided to rock the boat a little. 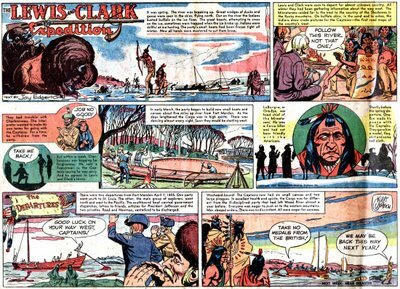 On March 7 1949 the feature added a daily strip. When that didn't help matters, they changed the title to Ben Friday (on 7/11/49) and the bodyguard role was bounced. Now Ben was free to adventure without those tedious bodyguard duties. But apparently the strip was still not selling, so the next step was to bounce Ben off the strip entirely via the matrimonial kiss of death. Our new head of operations was an Indian prince, a character that Friday had bumped into several times earlier in the strip's term. 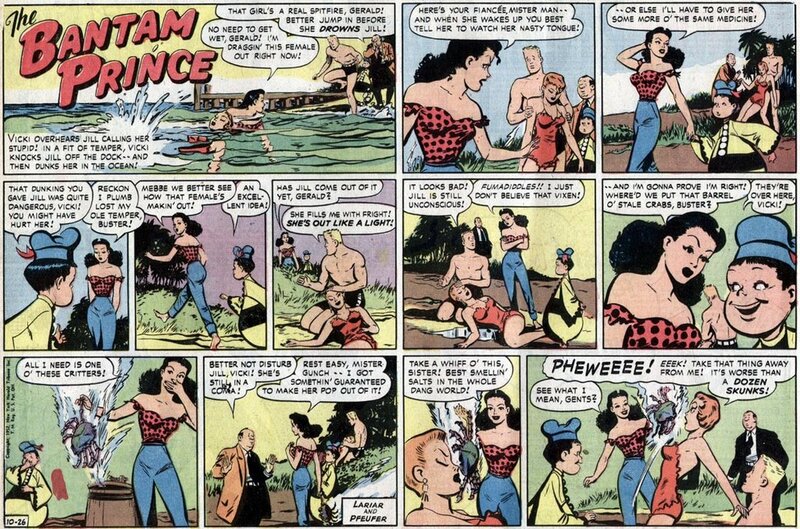 In October 1950 the strip was retitled Bantam Prince, and the adventure began to take a back seat to comedy. With the subject turning to comedy, the excellent realistic art on this feature by John Spranger seemed a bit out of place, and Spranger was probably glad to dump the assignment in June 1951. 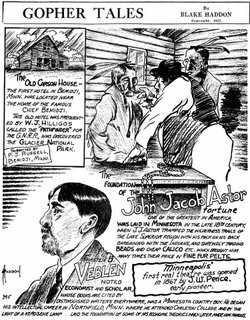 Spranger wasn't gone from the Herald-Tribune's syndicate books for long, though - he returned three months later doing the art chores on The Saint, a strip that also never became a syndication cash cow but at least held its own. Replacing Spranger on Bantam Prince was that master of bigfoot slapstick comedy, Carl Pfeufer. Oh, you say that Pfeufer was a great adventure strip cartoonist? Well, obviously that didn't stop the Herald-Tribune from wasting his considerable talents on this dead man walkin'. Pfeufer gamely stuck with this problem child to the end on February 28 1954. One additional note. Maurice Horn in 100 Years Of American Newspaper Comics calls this strip the Herald-Tribune's first foray into adventure strips. Not so. Their first adventure strip was Jeff Crockett which began on March 8 1948, two months before The Bodyguard. Yet another note. While it is an uncommon thing for a mainstream strip to change titles, The Bodyguard by no means holds the record by going through a mere three. I know of one that went through seven (well, five major changes and two minor ones). Can you name the strip and all the titles? Or, for some real serious brownie points, can you come up with one that went through more? And no, the story titles from Walt Disney's Treasury of Classic Tales don't count! Last note, I promise. Tomorrow I'm going to see a spring training game in Bradenton (dear wife's team against mine - Pirates vs. Rays). I have a long-standing tradition of getting a sunburn the shade of a well-polished fire engine when I go to spring training, so I may be in no shape to blog for a few days. Tune in to see if I finally end my streak of daily posts going all the way back to November. Almost as exciting as Joltin' Joe's streak back in '41, eh? Oops - Jeffrey Lindenblatt tells me that there is an even earlier Herald-Tribune adventure strip. It was called "The Underground" and it started on 6/4/45. For some reason I thought it was a humor strip so didn't count it. As discussed in a December post (see it here), I finally found a printed run of Montfort Amory's Pieces Of Eight strip in the Gainesville Sun, but could offer you folks no samples as the microfilm viewers I was using lacked print capability. Now, courtesy of Leonardo de Sa, I can share with you a few weeks of Burne Hogarth's work on that strip. De Sa, lucky fellow, actually found a few weeks worth of syndicate proof sheets of the strip, and he is nice enough to share them with us. Thanks Leonardo! I'll present the first week's worth today, the rest tomorrow. This first week from November is not signed by Hogarth, but there's no question that it's him. The second week, from December, is signed. Enjoy! 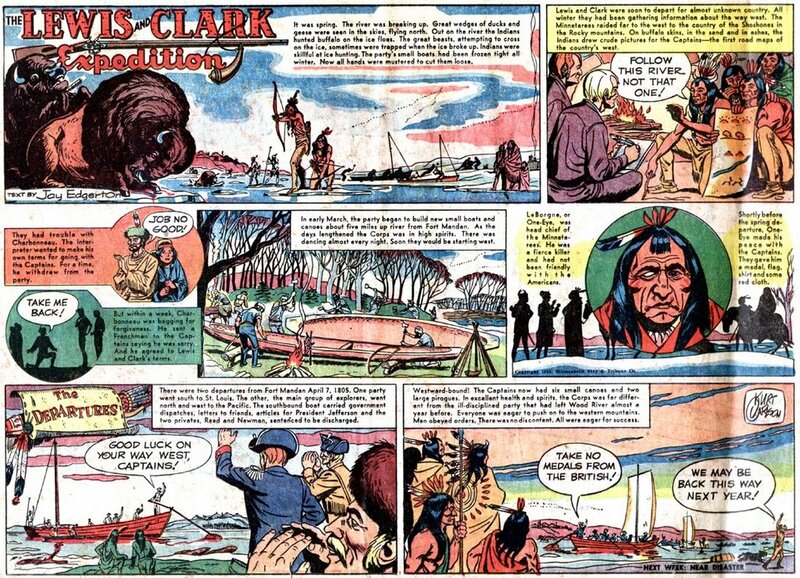 The Minneapolis Tribune celebrated the 150th anniversary of the Lewis and Clark expedition a little late, starting this closed-end Sunday strip on January 9, 1955. Jay Edgerton supplied the prose while Kurt Carlson did the art. Carlson did a yeoman's job on the realistic art, though his other major comic strip series, Smorgy, was done in a cartoony style. This series came to a conclusion on July 3rd of that year. In my parent's basement hung a SMORGY comic strip about the Minneapolis summer festival, the Aquatennial, which featured my dad, John Lamb. The strip is dated 7/24, but there is no year. 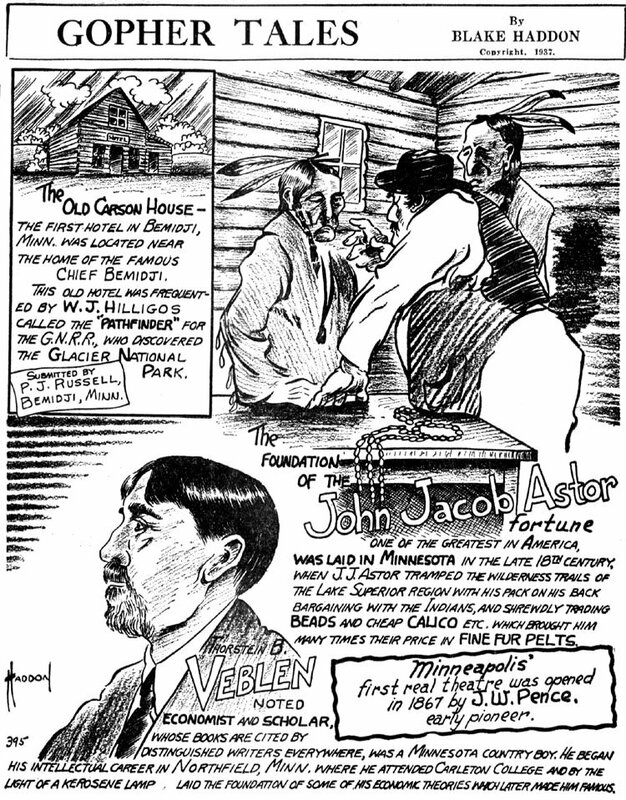 At the top of the strip, instead of a newspaper, it says: "The Upper Midwest's Own Comic." Do you have any suggestions as to how I might find a second original of the strip? Smorgy ran 1947-52 in the Minneapolis Tribune. 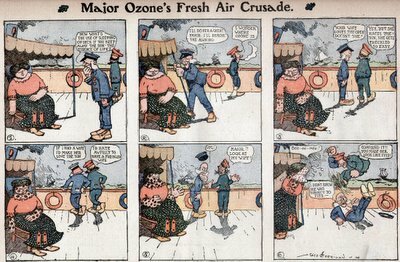 According to Patrick McDonnell in his superb biography of George Herriman Krazy Kat - The Comic Art of George Herriman, the great man's first run of Major Ozone's Fresh Air Crusade ran from January 2 1904 until July 10 1904. Reproduced above, however, is a Major Ozone strip that ran on July 17th 1904. Now this could just be a case of the strip running late in this paper, but that would have been an unusual occurrence. Major Ozone ran in the World Color Printing preprint sections, and those sections were all printed and shipped out to subscribing papers at the same time. Unfortunately, my source for this tearsheet saw fit to cut up the section to sell individual strips. Because of that I have a half-page with no masthead, and so don't know what paper this strip ran in. Not knowing what paper ran it, I have no way of doing additional research to find out if said paper was running their WCP sections late. Sigh. So do we have an additional Herriman Sunday not uncovered by McDonnell (who I'm guessing used the St. Louis Star as his source, where it did indeed stop on July 10), or not? No way to know, unless someone has the complete run to check against. Extra Credit Question: I considered explaining the reference in the final panel of Major Ozone, but what fun would that be? Huzzahs and felicitations to the first reader to explain the reference to 'Fitz'. You are absolutely correct DD! A true student of history you are. Here's another one of the New York Herald-Tribune's filler strips, a phenomenon we discussed back on this post. The interesting thing about The Duke And The Duchess is that it was one of very few fillers done by cartoonists who also did 'regular' strips for the paper. Kin Platt did this feature from 4/20/1952 until 4/18/1954, in addition to his art duties on Mister And Mrs. Of course, The Duke And The Duchess, like all the Herald-Tribune filler strips, ran on an occasional basis, so it was no great extra expenditure of artistic energy to dash one of these off every once in a while. Here's one of those locally produced features that take a Believe It Or Not approach to local history. Gopher Tales by Blake Haddon started in October 1935 and ran until at least 1937 (perhaps much longer). All my samples are from Minneapolis Tribune. It is unclear whether Haddon was producing it for that paper alone or if he was a freelancer trying to syndicate it to other Minnesota papers.